Do you ever get asked by your clients for complex Excel Reporting, fancy Offline reports or Dynamic Online Reporting but don't have the time or the knowledge to produce them? At Reporting Dashboards we get around that problem by building it for you. Whether your own reporting data, website performance (we can integrate with Google Analytics to provide bespoke automated analysis) or social media integration, we're here to help. No complicated software to learn, no prescriptive formatting. We take your data and build a set of reports tailored to your requirements that you will be proud of and your clients will love. We work with you as an extension of your company, offering experience and advice on the best ways to communicate and deliver your data to your end clients. With over 20 years experience in bulk report production and Market Research Support, we see online reporting as a natural development of data delivery. From proposal to implementation we aim to support your organisation throughout the contract cycle. We have worked on behalf of companies such as Jaguar Land Rover, Renault UK, Merlin Entertainments Group, Volkswagen and many more providing online, offline and Excel reporting with an expert view on how to best get the message and numbers across to the target audience. 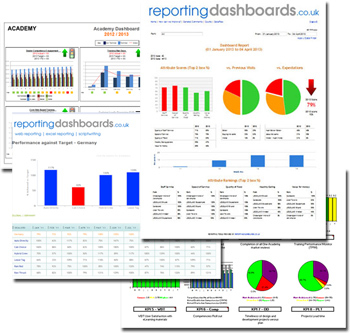 Reporting Dashboards can get your data to clients or members of your own organisation quickly and efficiently. 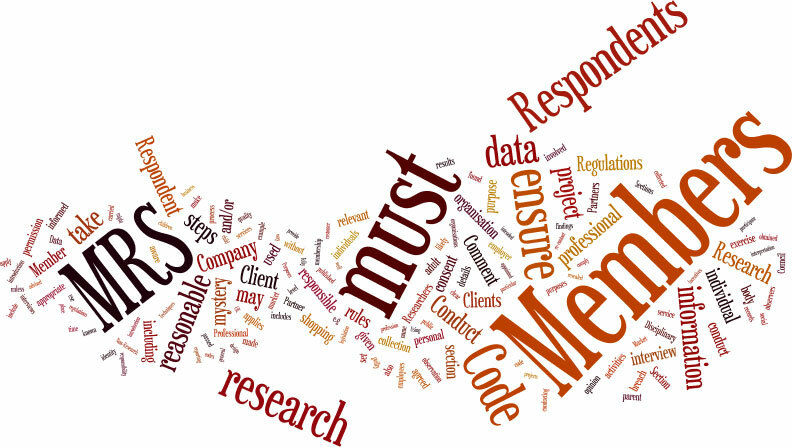 Data visualisation allows you to show data as information - bringing the key messages of your data to the fore as this word map of the MRS code of conduct demonstrates (the more prominent or repeated a word, the larger it appears within the image). "We have been designing and building online reporting suites for over 10 years. Seeing the rise of the internet we built our first online dynamic reporting dashboard in 2001. While by today's online savvy audience's standards this would seem clunky, basic and very, very out dated it was at the fore front of technology for its time, and as time has moved on - so have we. Online Reporting with data visualisation is in most cases the best way to get the message (and reports) out there and we aim to help you understand all the options throughout your sales and delivery process. In these online times, data visualisation is the key to getting your message across, simplify the information into easily and quickly understood pictoral imagery (charts, pictures, iconography, colour coding) and the report will be understood and digested without the main message being lost in the mass of numbers. The internet is familiar, habitual and for most users a lot less daunting that a pack of tables or powerpoint presentation"
"KPIs are commonly used by an organization to evaluate its success or the success of a particular activity in which it is engaged. Sometimes success is defined in terms of making progress toward strategic goals, but often, success is simply the repeated achievement of some level of operational goal (for example, zero defects, 10/10 customer satisfaction, etc.). Accordingly, choosing the right KPIs is reliant upon having a good understanding of what is important to the organization. 'What is important' often depends on the department measuring the performance - the KPIs useful to finance will be quite different than the KPIs assigned to sales, for example. Because of the need to develop a good understanding of what is important, performance indicator selection is often closely associated with the use of various techniques to assess the present state of the business, and its key activities." Using online reporting based on login information is an effective way to distinguish and distribute those KPIs relevant to the appropriate audiences. Just because a report is being delivered online doesn't restrict the ways it is provided. Online reporting can be a title for many methodologies. We can provide you with secure document portals for project management and document delivery, or dynamic websites backing your data onto a database that provides in depth analysis in real-time, allowing the user to select the data that is relevant to them. All of these sets of data can be restricted or defined by user as appropriate, so if for example you are reporting on a automotive dealer network, only the data appropriate to the login level is shown and available. We can help in producing your reports whatever the methodology applied. Whether it is the production of Excel Reports or Powerpoint Reports, Online tables and charts, result based icons, colouring and pictures, if you can mathematically define it, we can report on it dynamically. Report runs can be from a single desktop produced document, up to report runs into the thousands available in all of the normal reporting formats (excel, powerpoint, pdf etc) or as a dynamic reporting suite using a back end database to securely hold and analyse your data. If you have an operations requirement within your organisation but don't have the resources or need to take on a full-time employee, contact us today to see how we can provide operational market research support to your organisation. From setting up a CATI centre to migrating reporting systems we can assist you on a daily or contract basis. Operational Market Research is what we love doing - finding solutions to problems, delivering on projects and making sure that the service we provide helps your organisation to deliver what your end clients want. CVs are available on request detailing Iain's extensive experience in all aspects of Market Research Operations delivery and management. Contact us today to see how we can help you win more business by offering online reporting through your organisation or supporting you and your company with Operations Market Research Support.